“My commitment is to wake up as many people as possible to their connection to faith and joy. In that connection, we can be guided to our true purpose- to be love and spread love. These words can no longer be cute buzz phrases that we merely post on social media. Rather, these words must be our mission. The happiness, safety, and security we long for lies in our commitment to love.” Through acceptance, surrender, and a commitment to her continually evolving spiritual path, Gabrielle Bernstein has been transforming her fear into faith. Now, in this card deck, she shares the most powerful messages from her New York Times bestselling book The Universe Has Your Back to act as an oracle and guide to happiness, security, and clear direction. These 52 messages, on beautifully illustrated cards by Micaela Ezra, will help you find strength when you are down, synchronicity and support when you are lost, safety in the face of uncertainty, and joy in what might otherwise be pain. 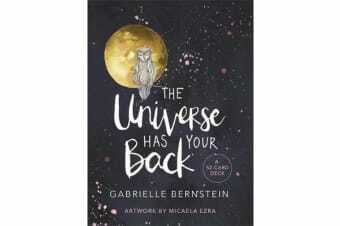 Gabrielle wants to show that no matter what, you are moving in the right direction, there is always hope, and the Universe will always help you!